I have had the privilege of traveling to several educational conferences the past 3 weeks. I am working through several observations rattling around in my brain so I figured it was time to start blogging again. In listening to educators in a variety of settings this summer, I continue to be surprised by the anger I encounter. Anger particularly aimed at 1:1 technology programs, but occasionally aimed at other initiatives such as curriculum review and evaluation systems. Admittedly, I am not strong on the feelings… but the intensity of the emotional reaction of some surprised me. These were educators of all age levels, public – private schools, K-20… I tried to move past the “WTH response” and really listen. What I heard…. I was in a session on, of all things, Ignatian Burnout (when one of your foundational prayers reads “to fight and not to head the wounds… to toil and not to seek for rest”– burnout takes on a whole new level) when the conversation once again turned to technology in the classroom. A teacher passionately argued that students were being harmed by technology. Others jumped in (including me) and the emotions started to run a little high… the teacher arguing harm left the room, clearly frustrated. I caught up with him later in the conference (because I am a 9 on the Enneagram and must peace-make). Turns out, it’s not technology that is the problem. 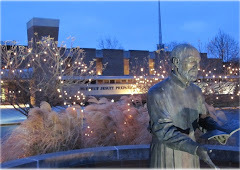 I finally heard his real concern – that by relying so heavily on messaging the school’s 1:1 program the foundational message of Ignatian Mission was (in his opinion) being silenced. In cases where mission and identity is seemingly overshadowed by contradictory messages, feelings of hurt, anger and confusion can arise. In the story above, as the only words being offered to socially construct the meaning of “school” were technology, 1:1, iPads… the teacher felt the entire focus of the school was shifting from the 450 year old tradition of Ignatian education. The teacher felt threatened which led to a feeling of isolation which led to anger and eventually a relationship out of balance. Being in “right relationship” is charism applicable to all settings. In schools, we often hear of failures of relationship – particularly between faculty and administration (transparency anyone?). Related to mission and the message, this is a two-fold issue. One is an issue of leadership. A significant danger of leadership is losing site of the message. Who we are as articulated by mission and core values is critical. When this message is diluted by a series of initiative jargon (IB, 1:1, STEM, PBL, Inquiry Learning, Merit Pay) we run the danger of creating harm in our learning communities. The second is an issue of listening with good will. When we stop active listening to each other (which includes questioning) then words become weapons. I was surprised when the teacher told me I was the first administrator to “really listen” to his concerns. Mind you, we had a 15 minute conversation during a coffee break – hardly an in-depth heart-to-heart. At the same time, the teacher admitted this was the first instance of him really listening to an administrator. Listening with good will is a powerful experience. There are a many initiatives in our schools, large and small. Forward movement requires a certain level of restlessness… and there is nothing bad about a little imbalance. However, we must keep in mind our mission as we craft our message. Words can hurt. Words can also define, excite and motivate. Remember the mission – the core values of your school – and frame growth in terms of that mission. How we talk about our schools constructs the reality of the day to day experience – and our schools are only stronger with strong foundations. I wish I could say that the idea of a playground for faculty (what we would call a MakerSpace in 2014) was all well thought out and planned. But it wasn't. The space was original made to house a special collection library from the Liberty Fund and function as a reading room for adults. Admittedly, JD and I saw a bit broader application to the space - and we acted on it as soon as possible. Of course, the Liberty Fund collection is still present in the room. complete set-up of classroom Extron system to experience and many print/electronic/human resources. We also have a Keurig coffee maker and snacks (usually - Social Studies is quite the group of hunter/gathers and often clean us out). Basically, anything a teacher would want to try before going into the classroom - we have the space to play. Beyond space is the human relationship element. In the picture above, you'll see three doors. The door at 3:00 is my office. While I moved into that office as Director of Faculty Development... I stayed when my responsibilities broadened out to Assistant Principal. Why? I like being close to the action of information services... I have more casual conversations about curriculum, technology integration and the values of DC over Marvel comics than I would if I had moved to the administrative suite. For me, the relationships fostered by my location, and the ability to sit and have a cup of coffee with a colleague, trump anything else. The door at 1:00 goes to the hall and the library. 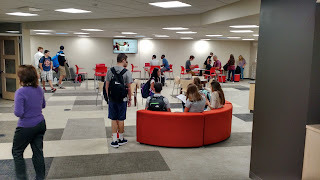 The proximity to the library, and future integration into the Information Commons, highlights our resolve that learning, research and reflection is not just for students. Students see adults engaged in new experiences, collaborating or working quietly... great modeling! The door at 9:00 leads to IT offices. Of course - you want to be close to the troubleshooters! And yes, that is JD's mess about 7:30. As I said in previous post, you have to make a mess to make progress and JD is the living image. Our 1:1 BYOT program was thought up, piloted, reflected on and implemented in the TRC. From everything to chalk-talks to Tech Petting Zoos to department Boot Camps... we did it all in the TRC. I strongly suggest anyone even considering a 1:1 or major technology or curricular shift create a TRC - a safe space for conversation and trial experiences. how 3D printing can be used in the classroom (this will change with renovations as students will have their own MakerSpace in the Information Commons). The space is used beyond any one technology initiative... discussion of curriculum, policy, evaluation process and assessments, architectural design, summer camps, athletics ... it all takes place in the TRC! Flexible furniture! 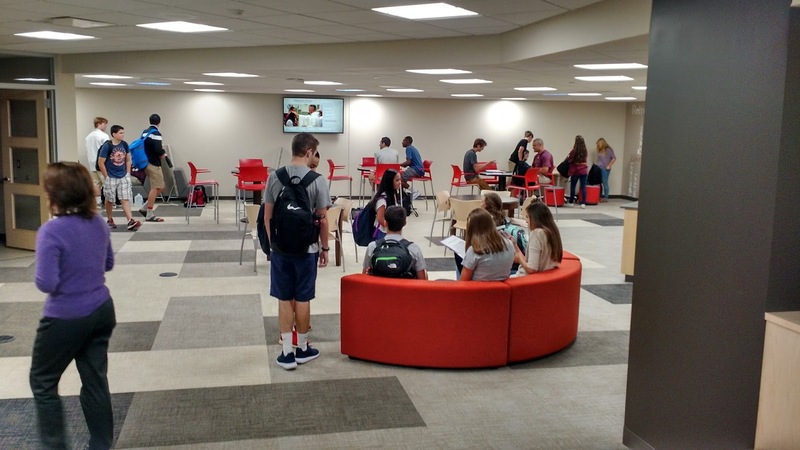 You'll want to re-arrange space for large/small, formal/informal groups as well as individual work spaces. The room cannot be on the meeting room schedule. We protect the space for organic experiences by keeping it off the Outlook room schedule. Everything in the classroom is present and available for faculty to try. The TRC was a safe place this summer as we trained, practiced and reflected on the new Extron system installed in all classrooms. This ensured on Day 1 that faculty were ready to go. Don't forget print resources... some folks still like to curl up with a print book on curriculum design or classroom management and that's okay. We cater to all users. Quick access to people who can help. In our case, the proximity to IT, Librarians and Administrators has made for quick actions to identified challenges (small and large). 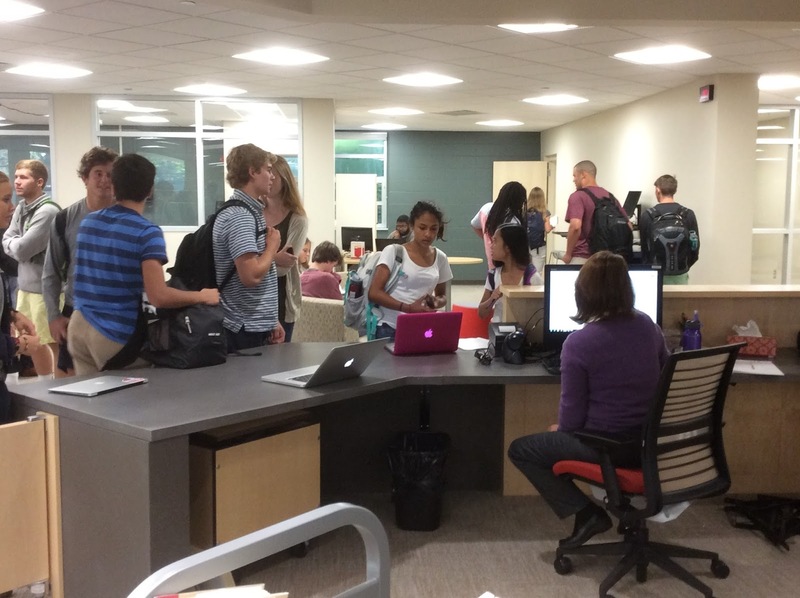 In the new space, the TRC will be a little smaller. It's okay...really. Through experience we have learned that the room is best used for small groups or 1 on 1 troubleshooting/brainstorming. An intimate space for personalized support. All the doors and offices stay put so the human side will not change. Plus we'll have a great new space outside the door for collaboration with others! So that's the TRC in a nutshell, Nancy :-) Glad you asked! !